The Promenade des Anglais is one of the world’s most famous coastal roads with seven kilometres of shingle beach along the Baie des Anges. Construction started in 1822 and the promenade is lined with luxury hotels including the legendary Negresco Hotel. 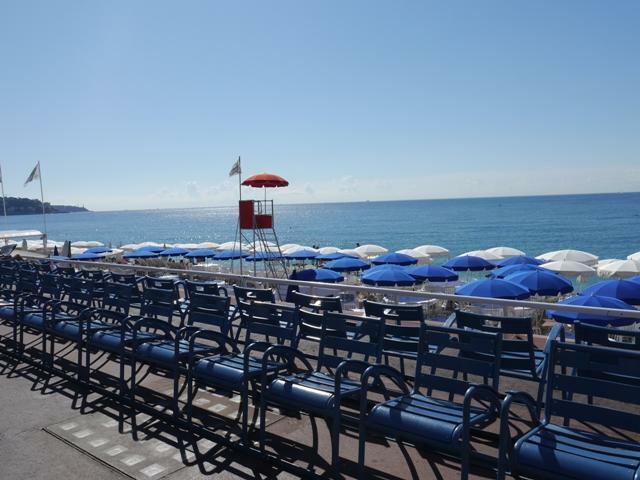 The famous blue chairs of Nice can be found along the promenade and in some of the gardens such as Albert 1er. 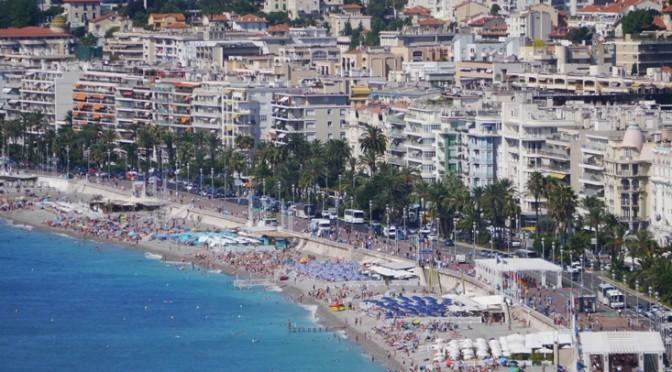 The beach at Nice may at first appear disappointingly pebbly but the beach is clean and the sea is a beautiful blue. The pebbles are referred to as galets by the locals. There are many public beaches and a number of private beach clubs including Opera Plage which claims to be the oldest in France. There are numerous other private clubs including Castel Plage which has an excellent restaurant, The Opera Plage and the Plage Beau Rivage which is affiliated to the hotel of the same name. Blue Beach is another excellent club and is stiuated near the Negresco Hotel. The private beaches are open from April until October and all propose beach mattresses, parasols, changing cabins and showers. 165 Promenade des Anglais. Children’s pool and playground, pedalos, restaurant 50 seats. 107 Quai des Etats-Unis. Jet Ski, restaurant 250 seats indoors, 150 seats outdoors. Promenade des Anglais (across from Hotel West End). Water skiing, parascending, paddling pool, volley-ball, ping pong, Open all year round and in the evenings July and August. 8 Quai des Etats-Unis Restaurant 200 seats. 71 Promenade des Anglais. Water- skiing, parascending, boccie, ping pong, restaurant 100 seats. Promenade des Anglais (near Jardin Albert 1er). Water-skiing, jet-ski, parascending, childrens pool abd playground, restaurant 120 seats. Promenade des Anglais (access from jardin Albert 1er). Restaurant 150 seats. Promenade des Anglais. Swimming pool, children’s games, pontoon with mattresses. 97 Promenade des Anglais. Swimming pool, children’s games, pontoon with mattresses. Promenade des Anglais (across from Negresco Hotel). Pedalos, gondolas, sea-water pool, pontoon, restaurant 200 seats on covered terrace. Quai des Etats-Unis. Water-skiing, parascending, windsurfing, restaurant 200 seats. 227 Promenade des Anglais. Volleyball, children’s swimming pool, restaurant 180 seats. Promenade des Anglais. Water skiing, parascending, paddling pool, restaurant 200 seats on terrace. Boat trips. 25 Promenade des Anglais. Near Hotel Westminster. Boccie, ping- pong, restaurant 150 seats. 58 Promenade des Anglais. Pool, pedalos, ping-pong, restaurant 130 seats on veranda.